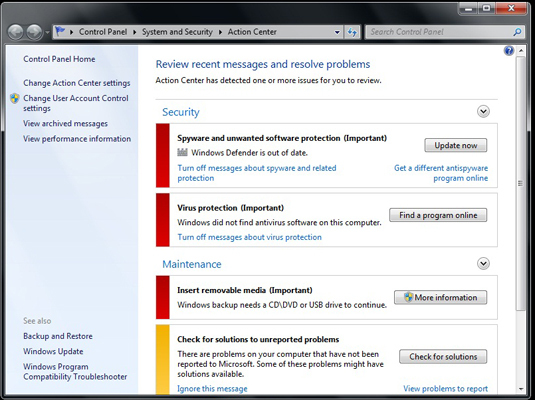 Windows 7 uses the Action Center as its primary tool for sending you messages and alerts. You can take control of the Action Center and tell it exactly which programs and functions you want it to keep track of. There are a lot of advantages to having Windows 7 alert you to problems with your system. It can be very useful to be reminded when you have maintenance tasks that need to be addressed or when your system security falls off the rails, but if you already know about the issue and you want to deal with it at your own pace, being constantly reminded can get annoying. 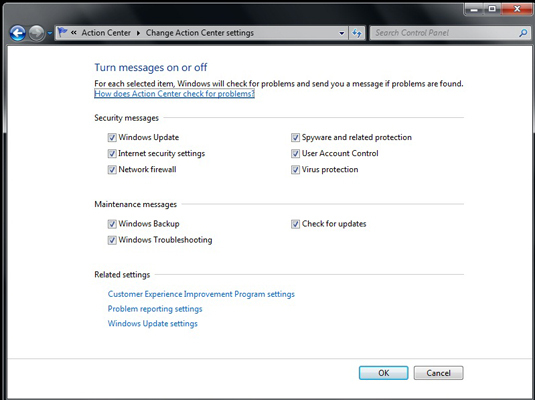 Fortunately, it’s easy to go in and tell the Windows 7 Action Center to stop notifying you about specific types of problems. Type action center at the Start menu and select the item in the results menu. You can also open the Action Center from the Windows Control Panel. Click Change Action Center Settings in the left pane. A window appears showing all the types of issues that the Action Center scans for. Deselect any items that you no longer want to be notified about and click OK.
You’ll no longer see warnings about those issues.